Q: Who can stay at the shelter? A: Youth ages 10-17 years can stay at the shelter. 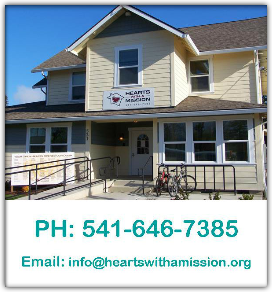 Hearts With A Mission services are available to all eligible youth regardless of race, color, gender, national origin, religion, sexual orientation or disability. Youth from outside of Jackson County are screened on a case-by-case basis and upon bed availability. Q: How long can I stay at the shelter? A: Youth can come into the shelter for up to 120 days depending on each youth's individual service plan and exit options. HWAM will due it's due diligence to gain consent from a parent or guardian upon intake and within the first 72 hrs of your stay. A: Our services are free for youth staying at the shelter; there is no cost for accessing any of the services provided. Q: What geographic areas does HWAM serve? A: We accept all eligible youth in need. However, Jackson County youth have priority since our shelter is supported by the communities in Jackson County. Q: How do I access your services? A: Youth can be referred from the community (friends, neighbors, churches, schools, etc), other agencies, their parents, or self-referred. There is no need to have a referral. If a youth is in crisis and willing to work with HWAM, then we are willing to work with them. Staying at the shelter is completely voluntary; youth are not required to stay a minimum number of days and they may leave at anytime. Likewise, if youth choose to disregard shelter rules, they are volunteering to exit. Q: Besides shelter and food, what other services are provided? Case Management: Every youth staying in the shelter will meet with their Case Manager on a weekly basis and develop a service plan and exit plan. Youth & Family Counseling: Our counselors provide education, advocacy, support, empathy, guidance and an open ear to vent and problem-solve in a non-judgmental, safe environment. Information and referral services: Youth and families will be linked to existing services in the community such as addictions counseling/treatment, medical care, housing, job training, etc. Educational Support: Youth staying in the shelter are required to attend school. youth who come into the shelter that are not enrolled in an academic program/school will work with the Education Coordinator and Life Coaches on an education plan that will include returning to school or working on their GED. Those who have graduated will be required to search for a job or maintain employment. Life Skills/Job Search/Recreational Opportunities: Life skills are a daily part of living at the shelter and working with our staff. Life Skills classes are also offered in the shelter and at other locations as available. Our Life Coaches will help youth seek employment, go over interviewing skills and resume writing. Recreational activities are offered weekly both in and out of the shelter. Mentoring and Guidance: Youth have the opportunity to be paired with an adult mentor with similar interests and personalities to provide further support and guidance. Aftercare Services: Aftercare services are offered to all youth who exit the shelter. Youth are encouraged to stay connected with our staff. Youth who exit the shelter can continue to receive educational support, counseling, clothing, hygiene products, mentoring and recreational opportunities. Non-resident Services: Youth not living at the shelter may also receive food, clothing, educational support, hygiene products, school supplies and other support services. Q: What is a Service Plan? A: A Service Plan is a plan created between a youth and a Case Manager that identifies what issues they have that are negatively impacting their lives, what barriers and challenges they have that are preventing them from rectifying those issues and what the goals are for them to work towards while staying at HWAM. A Service Plan will also help the youth and staff identify what safe options are available for an Exit Plan. Parents/Guardians are strongly encouraged to participate with Case Management and create their own Service Plan and goals for their child with the Case Manager. Q: What do youth have to adhere to in order to stay at the shelter? Be willing to work with a Case Manager and create a Service Plan (Service Plans are for youth staying beyond 72 hours) and be respectful to all the staff, volunteers and other youth living at the shelter. All youth utilizing the shelter have to follow basic rules while in the shelter, such as no drugs or alcohol, no smoking, no sexual activity or talk, no violent activity, no harassment of any kind, no gang activities or dress. Youth also have to contribute to daily household chores while at the shelter. These are used as life skills, learning opportunities, and also give youth the chance to take pride and ownership in the shelter. Q: I have heard that you are faith-based or Christian, do I have to convert to Christianity or go to church to stay at the shelter? A: We are faith-based but do not support preaching or forcing our beliefs on anyone. Being faith-based means that our staff shares a common belief that God is our Savior and has provided for us. Our staff shows their faith through love, kindness and their actions. We accept and support all youth with differing beliefs or denominations. Youth are not required to attend church, read the bible or pray in order to receive services. Q: What if I am not heterosexual or if I am transgender? A: Hearts With A Mission services are available to all eligible youth in Jackson County regardless of race, color, gender, national origin, religion, sexual orientation or disability. Q: How will I get to school? A: In most cases, youth ride the school bus or the city bus to their respective schools. The Life Coaches or Case Manager will help you get this set up or help you get bus tokens. Parents and guardians are encourages to help with transportation to school in other cases. As a last resort, our staff can transport you to school. Q: Can I have visitors and phone calls? A: Visitors are allowed with Case Manager approval and notification ahead of time. Visitor hours are reserved for Saturdays and Sundays for a maximum of 1 hour between the hours of 1-6pm. VISITORS ARE ONLY ALLOWED IN THE COMMON AREAS OF THE SHELTER. Youth can make and receive calls from the people the parent or guardian approve of on the youth's Approved Caller/Visitor/Outing list, created at the time of intake (updated can be made throughout youth's stay).